We already know that American government only responds to the wishes of the few. But what about other nations? Much of the academic work, and nearly all of the press coverage of the field, has focused solely on the United States. In a new working paper, a luminary in the field, political scientist Larry Bartels, expands his analysis to explore the relationship between policy and public preferences to the international arena. First, Bartels finds increasing demand for a stronger safety net across in many countries where data stretch back more than two decades, including the United States. 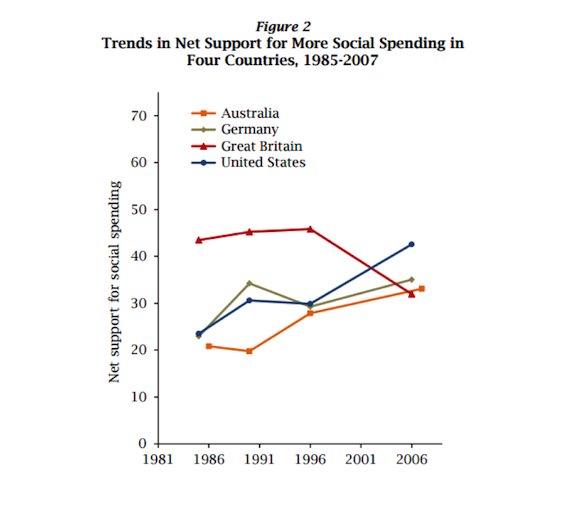 (Indeed, support for more social spending has increased the most dramatically in the US). He does so by using a question that asks individuals to indicate where they would like more government spending. (The question notes that tax increases may be necessary to boost government spending.) Although there are eight spending areas in the International Social Survey Programme (ISSP) data, Bartels focuses in on four: pensions, health, unemployment benefits, and education. 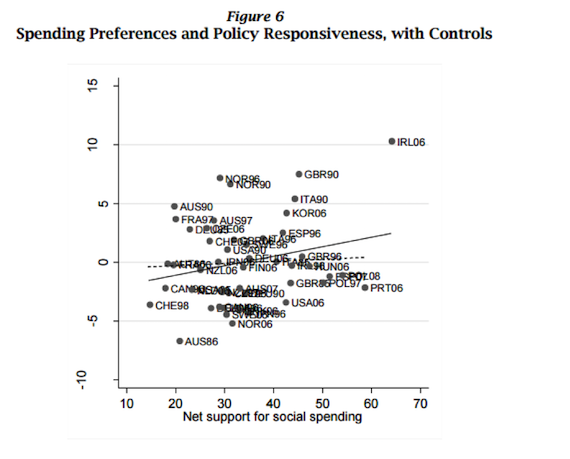 As the chart shows, the rich are less supportive of social spending, more supportive of budget cuts, and opposed to government guaranteeing jobs and reducing inequality (“welfare state values”). The United States was a leader in class conflict, with the largest gap between the rich and poor on social spending of any nation, the second highest gap on budget-cutting preferences (only Finland had a greater level of class conflict) and the fourth highest gap on welfare state values (after Netherlands, Sweden and New Zealand). The Nordic countries had among the highest gaps in opinion, suggesting that many of the rich may feel that the country has gone too far to reduce inequality and providing public goods. In only one country, South Korea, were the rich more supportive of higher social spending than the poor. In all countries, the wealthy were less supportive of “welfare state values” than the poor. When Bartels compared the policy preferences of the rich and poor to actual policy results (with controls) his results were disturbing. 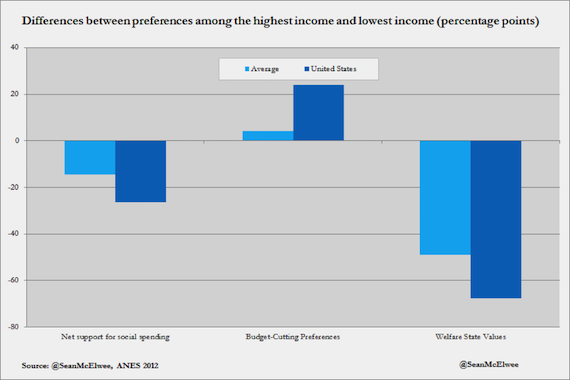 He finds that low-income preferences had virtually no effect on policy outcomes. Then Bartels, in a deeply original and important contribution to the literature, estimates what the effect of equal representation would be on social spending, and uses that measurement to conclude that, by contrast, biased responsiveness reduces real social spending per capita by 28 percent on average. In the United States, he finds that the gap is around 40 percent. To repeat: Social spending in the United States is 40 percent lower than it would be if policymakers didn’t disproportionately respond to the rich. A paper by researcher Derek A Epp, currently under review, suggests one possible source of the problem: “During periods of high inequality the government engages in fewer policy activities on a narrower range of topics.” He finds that redistribution is one of the first issues pushed off of the agenda. This is largely in line with the work of a group of political scientists who find that policy stagnation has reduced the ability of government’s to respond to rising inequality. Further, as I’ve noted, the agendas of the poor and rich are different, the poor and middle class tend to be more concerned with issues of redistribution like poverty and the minimum wage. Legislatures are increasingly stretched, and they rely more on pre-packaged bills by organizations like ALEC and turn to interest groups and lobbyists to help analyze and draft legislation. The literature on inequality and democracy continues to expand dramatically. There’s been increasing research at the state level, as well as new studies examining race, gender and the interactions of race and class. Further, studies are increasingly honing in on the donor class, differential turnout and rising economic inequality as explanations for this unequal representation. The solutions are simple to imagine, but more difficult to put into practice. Unions promote both economic and political equality - they both push up the wages of workers and mobilize politically for the interests of the middle class. Automatic voter registration would boost turnout, and combined with non-partisan get-out-the-vote operations offers the most viable route to boosting turnout among low-propensity individuals. Disclosure of campaign donations, robust public financing of elections and limits on the ability of corporations and wealthy individuals to influence elections could alleviate the pervasive influence of money over politics. 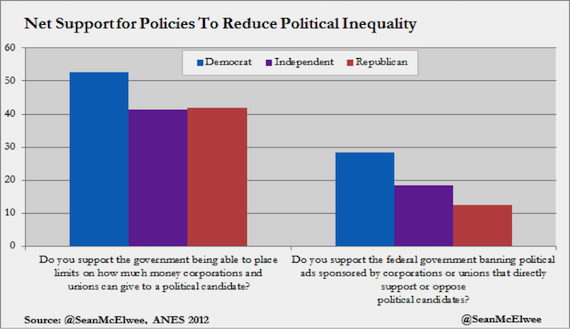 As it happens, policies to reduce the power and influence of the elite class over politics have broad public support, across all parties. (The charts above show net support, meaning I subtracted the share of people against the policy from the share in support.) The problem, of course, is getting the politicians already under the sway of powerful interests to pass laws limiting their influence over politics.